From lowering speeds and redesigning roads, to stronger enforcement and more bike lanes, New York is seeing a marked reduction deaths and injuries on its roadways — all by following a strategy that other North American cities have struggled to implement. "The last time city streets were this safe, people were getting around in a horse and buggy," New York Mayor Bill de Blasio said earlier this year. Vision Zero's goal is to reframe how cities look at traffic fatalities — not as "accidents" but preventable incidents that can be addressed through a combined approach involving road design, public outreach and increased enforcement. The term was coined in Sweden in the 1990s, and tailored programs have been rolled out by multiple cities in Europe, as well as more than 30 cities across the U.S. Variations of the program have been adopted in a handful of Canadian cities, including in Toronto, Hamilton, Edmonton, Montreal and Vancouver. While the National Highway Traffic Safety Administration says traffic fatalities have increased across much of the U.S., New York is bucking that trend. De Blasio, who campaigned heavily on the program in 2013 and during his re-election bid last year, plans to spend $1.6 billion US by 2022 to make the city's roads safer. City officials caution there's no one solution — and like anywhere, New York's bike lanes and the slowing of traffic have come up against stiff opposition. So while Vision Zero remains controversial, New York's transportation officials and safety advocates say the experience of the largest U.S. city offers a road map for others. Here's a look at five areas where Vision Zero is working in New York City. In the 1990s, Queens Boulevard was known as the "Boulevard of Death," a morbid nickname that reflected the carnage that was commonplace on the main thoroughfare that runs through the city's borough of Queens. According to the New York Times, a total of 186 people were killed or seriously hurt on Queens Boulevard since 1990. 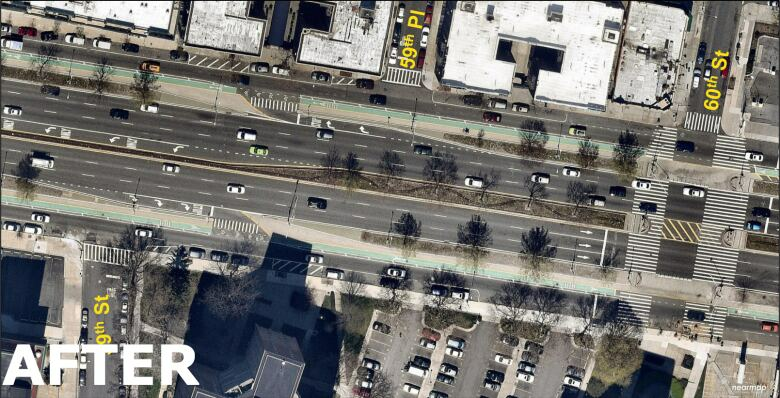 In 2015, a large stretch of the road was redesigned; Queens Boulevard underwent what's called a road diet. Two lanes of traffic were removed from the 12-lane roadway to make room for buses and bike lanes. To slow traffic down, the speed limit was reduced and lanes narrowed. Crosswalks were installed and medians were widened to give pedestrians more space and to shorten the distance they had to cross. Crossing signals were also tweaked, giving pedestrians more time. Protected bike lanes were installed along the centre medians, away from the parked cars and bus lanes. Since the changes, the number of deaths along the redesigned stretch of Queens Boulevard has gone down to zero. 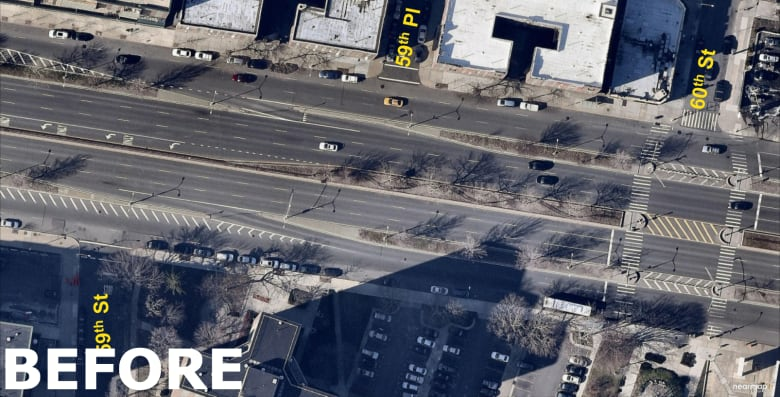 "If we could bring [Queens Boulevard] from the 'Boulevard of Death' to a place where people want to walk and want to bike, then really nothing is impossible," said Julia Kite, with New York's Department of Transportation. 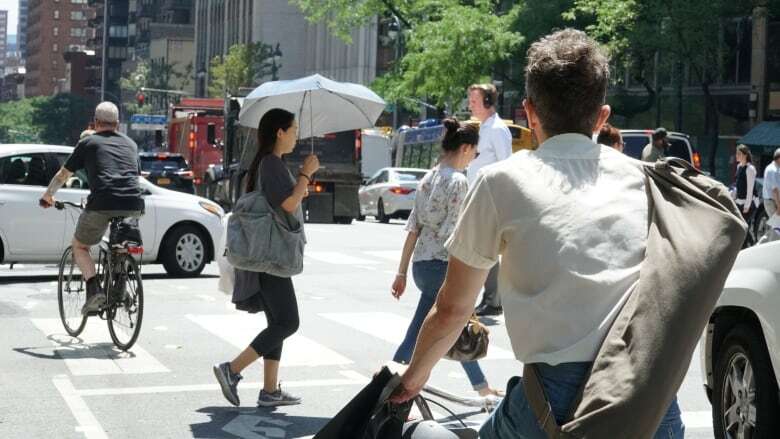 Giving pedestrians a head start of a few seconds — known as leading pedestrian intervals — is one way of engineering safety, she said. Research shows that this step, which was recently adopted at a dozen intersections in Toronto, reduces crashes by 60 per cent. "There's no reason to accept that it's just … the status quo, the fact that people are going to get hit or killed or injured in traffic," Kite said. "It's a way of realizing that we can engineer out of consequences of human error." 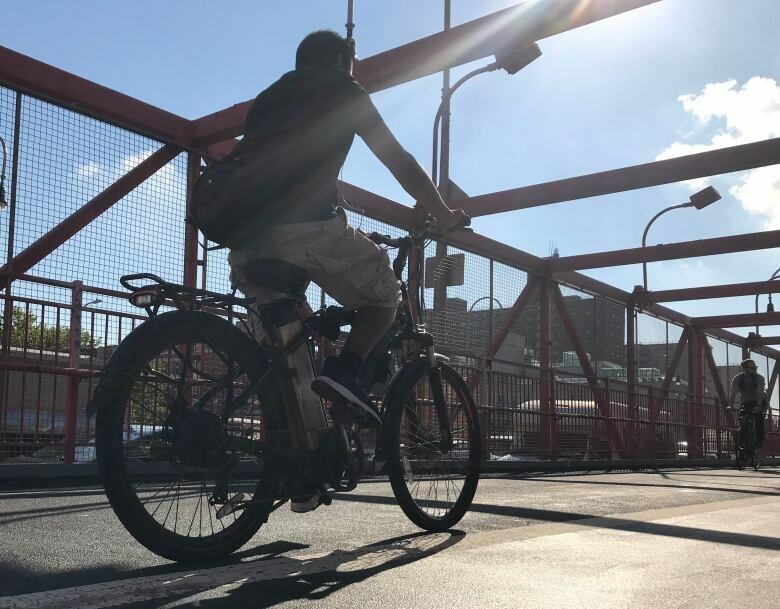 The number of cyclists in New York City has dramatically increased in recent years — and the city has been working to make space for them. Citi Bike, the city's bike-sharing program, has 12,000 bikes at more than 750 stations around the city, and more than 143,000 annual members. New York also has 738 kilometres of protected bike lanes, with close to 100 kilometres being built since Vision Zero started. "I think that things have improved tremendously in this city. I would not have imagined all these bike lanes every place — protected bike planes to ride in. 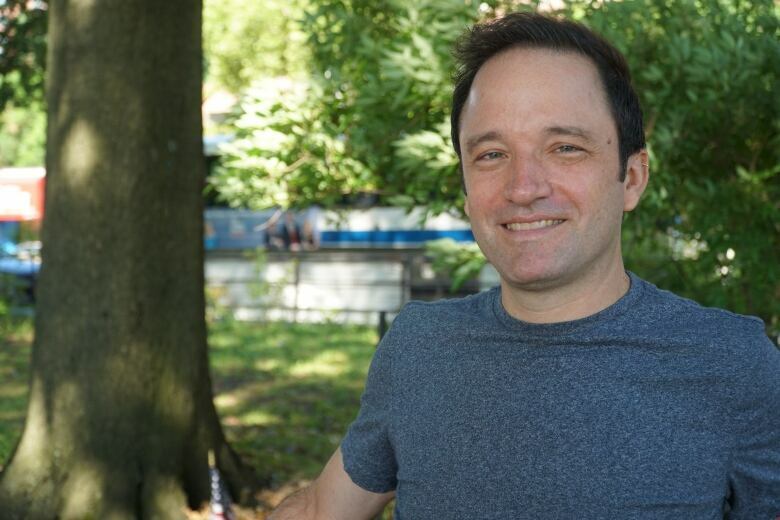 We've come a long way," said Eben Weiss, the writer behind the blog Bike Snob NYC. New York is no different from any other city when it comes to drivers, cyclists and pedestrians arguing about who owns the road, he said. Yet despite its recent successes, Weiss says the city still has a long way to go to bring cyclists up to an equal footing with cars. "These bike lanes are tiny slivers in a city that is just criss-crossed with highways, parking garages, everything.… It's so skewed [toward drivers]," he said. 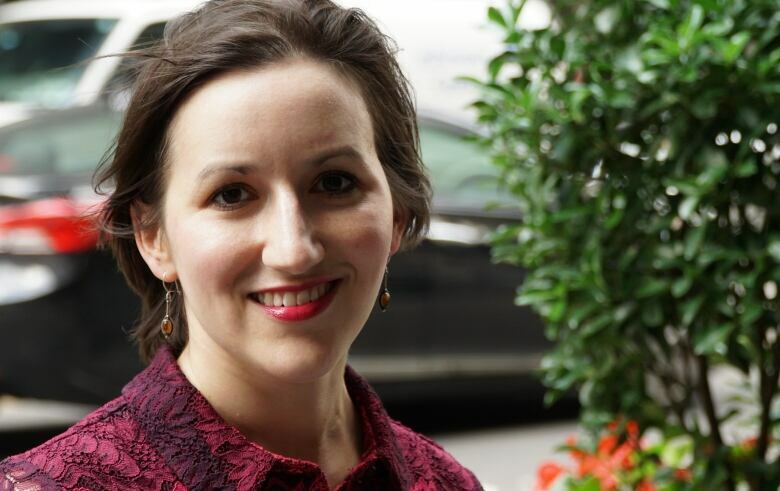 "We are taking something massively skewed and making it a hair less so." According to New York officials, simply redesigning roads won't achieve results without traffic enforcement to back it up. Under Vision Zero, the city has increased the number of traffic tickets issued for offences such as distracted driving, speeding or failing to yield to pedestrians by nearly 40 per cent. "While we can never completely eliminate people making mistakes, we can make sure that those mistakes don't have catastrophic consequences," said Kite. "We're taking a combination of engineering enforcement and education to make sure that this reaches all New Yorkers." Failing to yield to a pedestrian. Failing to stop on a signal. Between 2013 and 2017, the number of summonses issued for these offences increased by 41 per cent. While traffic enforcement can sometimes be viewed as arbitrary or a money grab, the numbers may tell a different story. Toronto, for example, is seeing an opposite trend. CBC News looked at the number of traffic tickets issued for similar offences to those identified as key to safety by New York City. According to numbers from the Ontario Ministry of the Attorney General, the number of traffic charges laid in Toronto between 2008 and 2017 decreased by 45 per cent. During that same period, Toronto police report the total number of traffic fatalities in the city increased by 16 per cent. Pedestrians deaths alone increased by 37.9 per cent. This year is shaping up to be even deadlier, with 20 pedestrians and three cyclists killed so far, according to Toronto police. Controlling speed has been a major — and controversial — part of New York's Vision Zero program. In June 2014, New York installed cameras in 140 school zones to serve as a deterrent to speeding. In the program's first two years, the number of speeding violations issued in the camera zones decreased by 63 per cent, injuries were down 17 per cent and fatalities were down 55 per cent. "The evidence shows that even the difference between being hit at 30 miles per hour (48 km/h) versus being hit at 25 miles per hour (40 km/h) makes a tremendous difference in pedestrian odds of surviving," Kite said. But the cameras went dark last month, the victim of a battle between state and municipal governments. 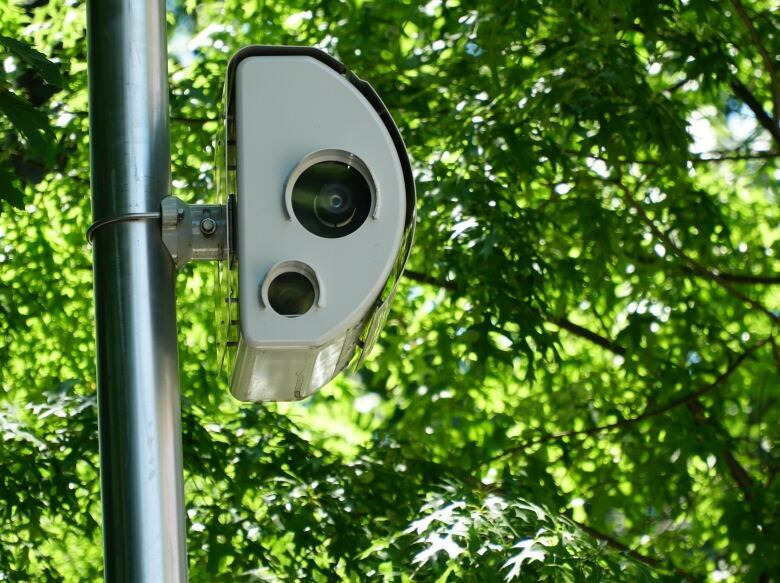 The temporary law authorizing the cameras expired as state legislators argued about next steps, ultimately ending their session without issuing an extension — even as city officials touted the success of the cameras. North of the border, some Canadian cities are starting to drop speed limits, too. In Montreal, for example, the maximum speed on some major arteries has been dropped to 40 km/h and 30 km/h in some school zones. But some residents say speeding remains an issue and enforcement needs to be increased. Implementing Vision Zero hasn't been easy. The difference in New York has been political will. 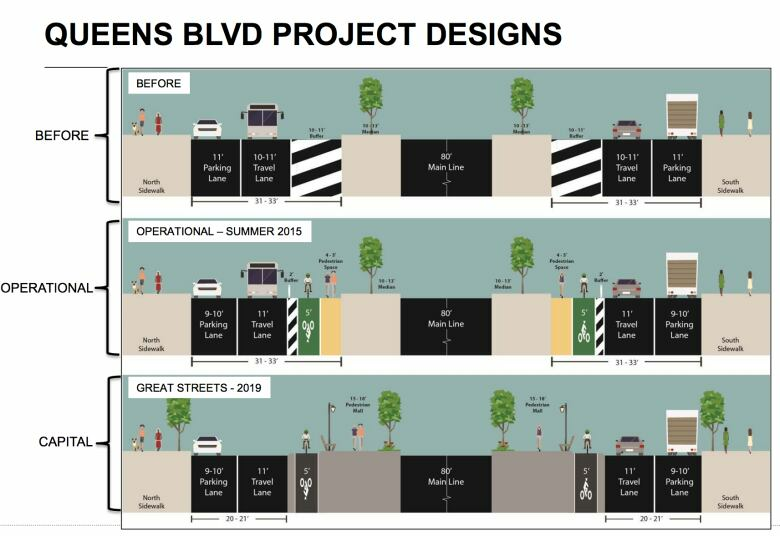 In July, after a months-long debate over protected bike lanes in one Queens neighbourhood, where the community voted heavily against them, the mayor overruled that decision and went ahead with the plan anyway. "We think safety has to be a priority; we can never sacrifice safety for convenience or anything like that," said Kite. And there are lessons for other cities struggling to make Vision Zero a reality, she says: Have a lot of tools ready and realize that no one solution or template will work everywhere. "It's got to be a combination of things," she said. "You've got to have a really strong team always looking at what's going on, looking at the data, and making sure what you're doing is grounded in evidence. "And [then] combining different strategies into this one picture of safety."